Graphics Amplifier makes titan Titan X graphics a reality. From Steam Machines and other small PC form factors to graphics cards such as AMD's R9 Nano, PC gaming has taken strides towards the living room in recent years. Alienware's original X51 system that launched in 2012 was one of the first gaming PCs to adopt a less-is-more approach to design. Following on the from its successor, the X51 R2 from last year, the company's new X51 R3 packs Intel's new Skylake processor and a custom liquid-cooling solution. Its every bit as compact as previous models and similarly easy on the eye. While it probably won't blend in with that Ming vase on your mantlepiece, it wouldn't look out of place on top of a desk or squeezed in beside a TV or home entertainment system. Almost square-shaped in design, the Alienware X51 R3 is only slightly longer than it is wide. It's around the same size of an Xbox One but can stand up straight or be lied flat unlike Microsoft's console. Not a great deal has changed from the original X51's design. 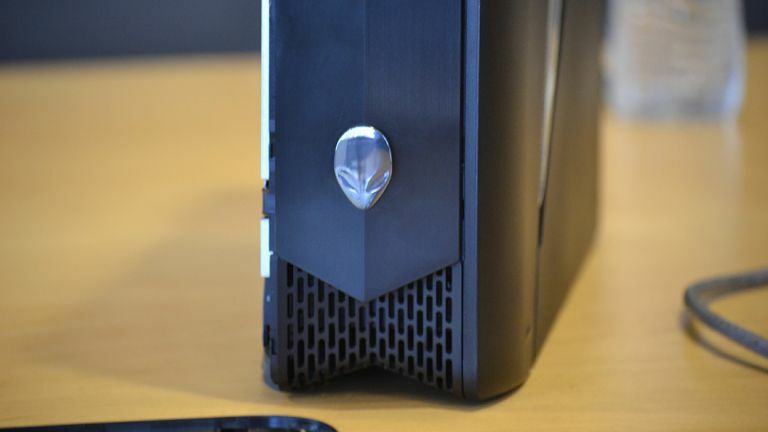 Clad in matte black plastic with a green diagonal strip along the sides, it places a ventilation grill towards the front's bottom edge below an Alienware logo. It's a classy design that hasn't lost its allure in three years, and if you like how consoles look when they're sat on a shelf then you'll take to the X51 immediately. Its compact chassis means space on the inside is limited, so there's no CD drive. You do get a removable tray for the GPU, which allows single-width cards, alongside an M.2 PCIe SSD and standard 3.3-inch HDD for storage. We don't have any benchmark figures to share, but the Alienware X51 R3 should pack a punch. Inside is an Intel Core i5-6600K (6MB cache, overclocked up to 3.2GHz) CPU, which is backed up by 8GB of RAM. You can bag more power by upgrading it to an Intel Core i7-6700K to chew through more CPU-intensive games. If you really want to future-proof your purchase, opting for the best graphics card on show would be the better option. In this case, that's an AMD Radeon R9 370 with 4GB of DDR5 memory or Nvidia's GTX 960 with 2GB of DDR5. Figures provided by Nvidia show that the new X51's Intel Core i7-6200K processor is 20% faster than the Intel Core i7-4790 in last year's X51 under 3DMark 8's Fire Strike benchmark. Of course, we'll be verifying those ourselves in due time. The X51's components are kept cool using a new CPU liquid cooler, which combines a pump and radiator into one device. Packing support for Intel's sixth-generation Core i5 and Core i7 processors, it should mean that you can bundle higher-end components into the build without the system overheating and going kaput. Alienware has made the X51 R3 compatible with its Graphics Amplifier. A £199 box that connects to the X51 R3 using a proprietary connection, it can be used to hook up a top-spec graphics card such as Nvidia's Titan X to add extra muscle power for tearing through games. Aside from extra cost, the downside is that the amplifier is about half as big as the X51 itself, which somewhat detracts from the appeal of splashing out on a compact gaming PC. The X51' R3's compact chassis has left enough room for two USB 2.0 and two USB 3.0 ports on the rear of the machine, along with a proprietary connection for the Alienware amplifier. 802.11ac Wi-Fi is build-in for communication, along with Bluetooth for hooking up peripherals. The Alienware X51 R3 features a slew of attractive upgrades, but it still doesn't make much sense as a purchase unless you're specifically after a smaller gaming PC. Its custom liquid cooling solution is smart, but the GTX 960 graphics card that comes with the top-spec configuration is far from the most powerful out there. Once you've added on the cost of a Graphics Amplifier and external graphics card you could have picked up a larger more powerful PC for less money. On the other hand, if you are seeking a compact frame cruncher then the X51 R3 remains one of the most smartly-designed options out there.